We were using The Ordinary Parent’s Guide to Teaching Reading by Jessie Wise and Sara Buffington. However, the curriculum really didn’t suit my gal, and I’d been really curious about what All About Reading had to offer. So, I switched it up. We’re now using level 1, and we love it. It’s hands-on, has reinforcing activities, and most importantly really works well with my gal’s learning style. They just came out with a color version, and it’s gorgeous. I’ll be talking more about that next week. For writing, we’re doing a lot of tracing of words and letters, but we’re also reinforcing proper letter formation using Zaner-Bloser Handwriting Grade K. We do a page or two each day. She loves this. I started with MCP Spelling Workout A before I switched to All About Reading. I’m on the fence about continuing with it or changing to All About Spelling Level 1 once we finish All About Reading Level 1 and begin Level 2 as recommended. For literature, I’m working on making sure she’s familiar with classics and contemporary picture books. We’re using a variety of resources as well as the book, fairy tales, poetry, nursery rhymes, etc. lists from What Your Kindergartener Needs to Know. We’re using Singapore Math Essential Math Kindergarten A and B. We’re about halfway through book B, so we’ll be starting the “first grade” book probably in March if we keep moving at the pace she’s setting. She loves math. I’m using Kumon’s Kindergarten Thinking Skills Workbooks. We’ve almost finished the Logic book. Science is kind of a hodge-podge, like literature. 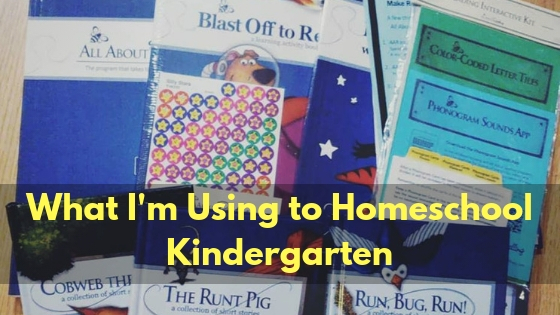 It’s partially interest-based, partially driven by what’s in What Your Kindergartener Needs to Know, and partially based on various science kits we have and fun experiment ideas I come across that fit the season/interests. I just got 180 Days of Science to add to the mix just to make sure we’re hitting all the standards and building a solid foundation for 1st grade. Science is another favorite subject, so we also read a lot of books on topics and watch YouTube videos. We’re reading a variety of picture books about historical events and biographies of great figures. We also read selections from What Your Kindergartener Needs to Know and discuss what we read. For geography, we’re using DK Geography, Kindergarten. We also have a daily calendar we do, and we’re using My Book of Easy Telling Time. We also do a lot of talking about community roles and safety and other things. We do a lot of art projects, drawing, coloring, etc. around here. She also has a class she does with her grandparents and loves. We’re taking a break from violin at the moment. We listen to a variety of music, and I point out the different styles and talk about instruments and famous musicians. We’re doing Girl Scouts this year, and a dance class. She wants to do a running group for kids this spring. We also go to the local zoo’s classes as we can. Posted on January 17, 2019 by Ronda Bowen	• This entry was posted in Kindergarten, Planning and Organization, Uncategorized. Bookmark the permalink.